Mother’s Day in Mexico is probably not like what you’re used to wherever you come from. In Mexico, it always falls on May 10 and here in Jalisco, it’s sometimes celebrated with games in the community bullrings. Certainly, not everyone observes Mother’s Day like this, but as seen by the filled seats, many do. In fact, I have never seen so many people waiting in line to get into the bullring as I have on Mother’s Day. The line stretches for a few hundred feet with children, their moms and dads, excited for another year of traditional games and fun. Though in the moment you might not realize that this kind of thing is a tradition in the stilted, ritualized sense of the word — because everyone is excited and having fun. The 12-piece banda blasts tunes from speakers loud enough (and at the right angle) to travel to the other side of town. Miles. And the mamás participate in Mother’s Day activities, taking over the roles in the bullring, still mostly filled by men, such as wrestling calves. But straying into men’s territory more or less stops there. Instead of riding real bulls, or small cows, a mechanical bull is brought out. 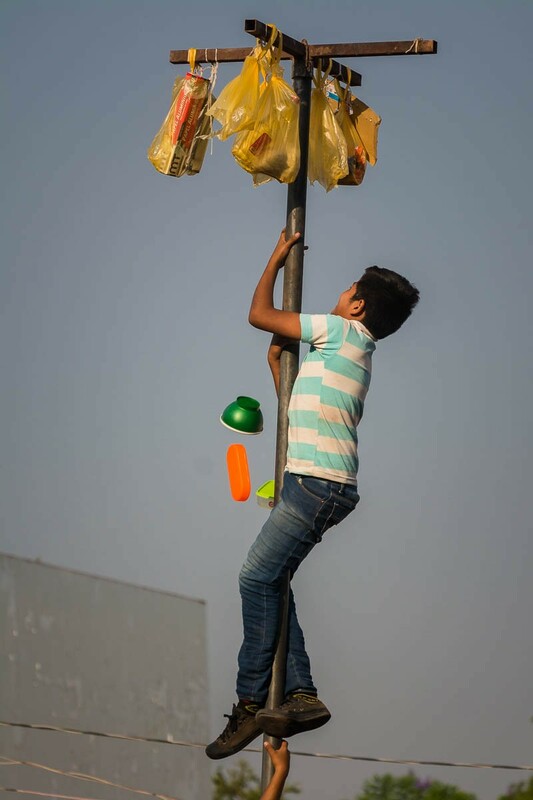 The palo encebado, normally used solely in a traditional Latin American version of “grease the pole,” also gets used as a strip pole. This was by far the favorite part of the show for everyone. No one actually took any clothes off (OK, one mamá took off her jacket), but a long line of mamás stood to take their chance at winning. What were the prizes? The prize given out for being able to wrestle a calf and remove a tied rope from its neck is cold hard cash. The prize for the fundraising raffle was a set of glassware. The prizes that the kids get for climbing up the greased pole include Tupperware, cereal, aluminum foil, and other things kids love. Two mothers compete in games during the 2017 Mother’s Day celebrations in Ajijic, Jalisco, Mexico. This is a Mexican rodeo, not a bullfight. Mexico has the highest number of bullfighting rings second only to Spain. But most of its community bull rings are used for the rodeo, which in Jalisco has strong roots. Announcer Ernesto Gonzalez keeps the pace of the event going, inserting his patter between the songs played by the banda on the bandstand. A young bull charges two mamás on Mother’s Day in Ajijic, Jalisco, Mexico. Another team competes to round up a bull on Mother’s Day in Ajijic. Once down, the object is to remove a rope that is tied around the bull’s head. The bull must be steadied while the madrecitas try to remove the rope tied around the bull’s head. Success. And a cash prize. Kids play in the dirt in the town bulling, Ajijic, Jalisco, Mexico. The stands fill up completely for the annual Mother’s Day event in Ajijic. The line for the entrance was 250 feet long. Cowboys rope in a bull after one of the games during the Mother’s Day event in Ajijic, Jalisco, Mexico. El palo encebado, the greased pole, was not actually greased up on this Mother’s Day. Kids must shimmy up the pole and tear down the bags of prizes, usually containing practical items such as beans, cereal or aluminum foil. These glassware sets are being handed out as prizes to winners of a raffle on Mother’s Day in Ajijic, Jalisco, Mexico. A cowboy subdues a bull after one of the games in the bullring during Mother’s Day in Ajijic, Jalisco, Mexico. 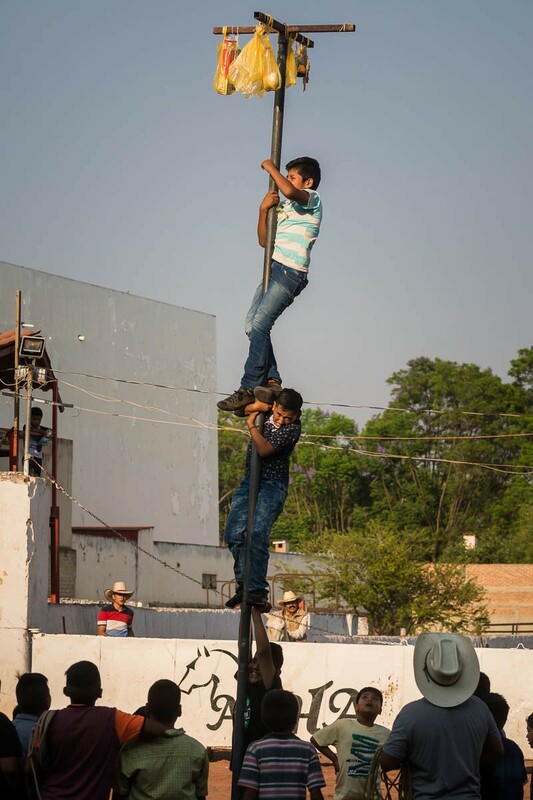 Kids watch the mommy pole dance competition during the Mother’s Day celebrations in Ajijic, Jalisco, Mexico. The mamá pictured went on to be the winner by a round of applause.